I am amazed how some of my blog topics come about. Sometimes, something that has happened in my daily goings on sparks an idea for a post and sometimes, like this week, the idea came for a source greater than myself. Let me explain this weeks inspiration first before I go on to my post. 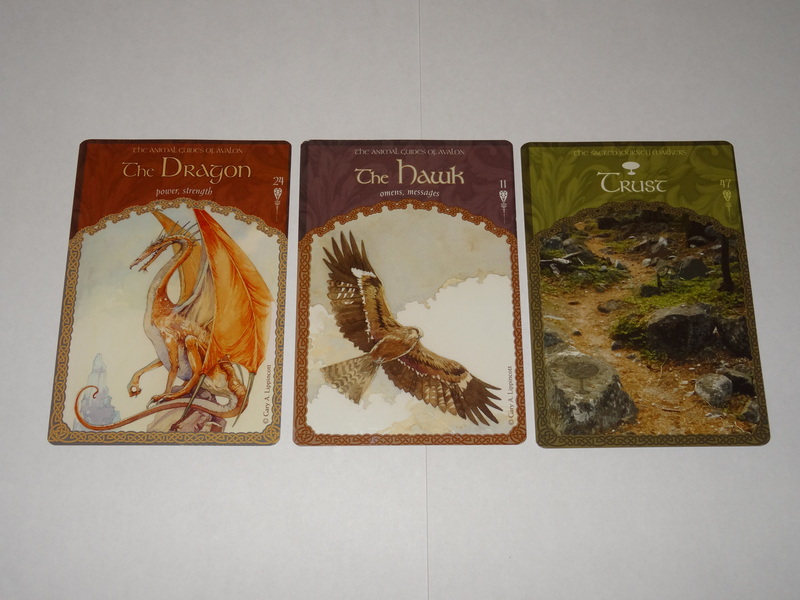 The Dragon – inner soul power and strength. The Hawk – look for messages, signs and omens. Trust – be aware of your ability to trust (trust issues) and have faith in your connection to the divine. I won’t go into my interpretation of the cards but felt it best to keep my heart and thoughts open and look for messages from the universe and trust that what I need to know will come forward. Note: the universe is always sending us messages but we humans tend to ignore them. It was an amazingly clear and warm day after a storm the day before so on my way to work while waiting for a traffic light, I paused a moment to take in the sun filled sky. As I looked up I immediately noticed a hawk circling above me. Hmmm, a hawk. Was he a reminder to look for signs from the universe? While waiting for the last 10 minutes of the day to pass so I could close up the store for the night, my mind went to thinking about my next blog post and the words faith and trust just popped into my head. Hmmm, was this a collective unconscious message from the universe? That night after dinner, I picked up my latest book to spend a quite hour or two in fluff and fantasy. In the fifty or so pages I read the characters brought up the need to have faith and trust in their situation four times. I kid you not. The book is called “Blood Magick” and is a new release from Nora Roberts. Hmmm, could this be an omen written in the pages of the queen of romance’s latest book for me? So what about faith and trust? What is it that I need to know about them this week? What’s so important that the universe felt obliged to send me several notices to make sure I got the heads up? 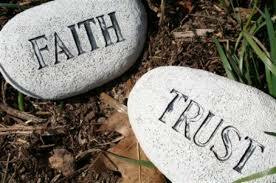 No matter what you believe or what your personal belief system is, the bedrock of that belief is faith. There must be a certain level of acceptance of the doctrine that resonates in your soul first before you can be certain that the message presented is true for you. Faith is a belief that is not based on proof. When you first start believing about something there is an expectation that what you are being told is the truth because at this point you have no personal history behind the belief to back up any claims with certainty. As you experience proof of the belief, you build a internal trust bank that in turn strengthens your faith in the belief. This happens with anything you believe in not just your spiritual or religious convictions. Let’s take a lifestyle belief as an example. You are introduced to a raw food diet by an article you read in a healthy living magazine. The concept resonates in your soul as an eating regime that will give you everything you desire in health. So you take a leap of faith and get a recipe book and learn some raw food dishes while you continue to research the benefits. You are still working on faith at this point as you have no personal proof yet that the diet works for you. After a few weeks you begin to notice you are sleeping better, your skin is clearer and your clothes are a little looser. With that realization you just made a major deposit in your internal trust bank. Your personal experiences are giving you the proof you need to confirm your new belief system. As time goes on and you realize how amazing you feel and that your body is running at optimum levels, your faith in this new lifestyle belief becomes certain. You have become devout and completely trust the diet regime and way of life. Even if in a moment of weakness you sway from your belief and end up at MacDonald’s horking back a Big Mac meal super sized, the trust and faith you have built in the raw diet way will bring you back on track. Disappointments, failures and lies are big withdrawals from an internal trust bank. It is only when we bankrupt the trust that we loose faith in a belief and turn from it. We give up on our dreams, break away from our spiritual and religious upbringings or fall off the diet wagon. As the week closes and I give thought to where I may have needed to exercise my personal faith and trust, I realize that yes there were a few disappointments but nothing that would have bankrupted my internal trust bank. But then again, maybe if I hadn’t paid attention to all those messages and omens and didn’t spent time pondering the subject, those disappointment may have been greater. But I did pay attention to the signs and omens and because of them, I got the message. Trust in myself. My inner dragon is powerful and full of creative fire. As a result, my internal trust bank just got a big deposit of proof of faith.